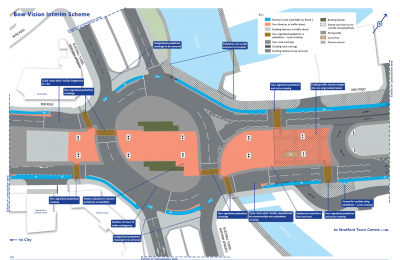 There is a current TfL consultation about improvements at Bow roundabout, principally for pedestrians but also affecting cyclists. See consultations.tfl.gov.uk/roads/bow-vision. On Saturday March 14th there is a public exhibition at St Mary's Church, 230 Bow Road, London E3 3AH between 11.00 and 15.00. Active THW campaigners are planning to go along at 11.00 and are hoping to meet local councillors there to discuss the proposals. If you are interested in joining them please contact gerry@wheelers.org.uk. If that time isn't convenient then just go along later - my experience of the TfL public exhibitions is that they are a good opportunity to see the plans on large drawings (much easier than peering at the computer screen) and also to talk to TfL staff. The on-line consultation closes 1st April.